The LG Optimus L5 II feels a lot like a downsized L7 II. It has a 4” WVGA screen, which is a lot better than what we saw on the original L5. Viewing angles aren’t great – certainly not as good as LG’s high-end phones, but it’s enough for the phone’s position in the pecking order. The CPU clock speed has been bumped up a bit too – it’s now at 1GHz, but there’s a single core, unlike the L7 II. The phone runs Android 4.1 Jelly Bean with LG’s familiar customizations. The LG Optimus L5 II has a dual-SIM twin, the L5 II dual. You can tell the two apart by the keys under the screen – the dual-SIM version uses only capacitive keys. The hardware Home key has been dropped to make room for the SIM switch button. That’s a shame – we really like the color LED notification light around the hardware key. The single-SIM version of the phone comes with a nice UI that lets you customize the colors of notifications for different events, same as on the L7 II. The second generation of the L series concludes with the cute little Optimus L3 II. As the very name suggests, this is the entry level offering in the range. 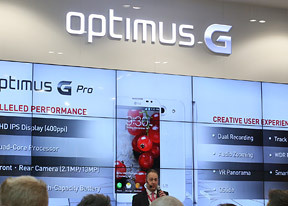 The smartphone has a tiny 102.6x61.1x11.9mm body with a 3.2” IPS LCD display of QVGA resolution (320 x 240 pixels). Just like the other members of the lineup, the L3 II is entirely made of plastic, which feels nice to the touch, despite the phone’s low price tag. On top of that, we are quite fond of the LEDs that reside under the home button and give the L3 II more character than many of its low-end rivals. The low screen resolution isn't great for long reading or browsing. Colors are a bit pale as the contrast isn’t great either. Under the hood, there’s a Qualcomm MSM7225AB chipset with a 1GHz single-core CPU and 512MB of RAM. It may not sound like much, but with the helping hand of Android 4.1.2 Jelly Bean and its Project Butter it keeps things well in order. Plus the low resolution is not that demanding. Just like the rest of the L II pack, there’s a dual-SIM version of the L3. The L3 II Dual loses its hardware home button, so an additional capacitive SIM management button can fit below the screen. The LG Optimus Vu 2 is not a new device (it's been around since late last year), but we snapped a few up close shots for completeness' sake.